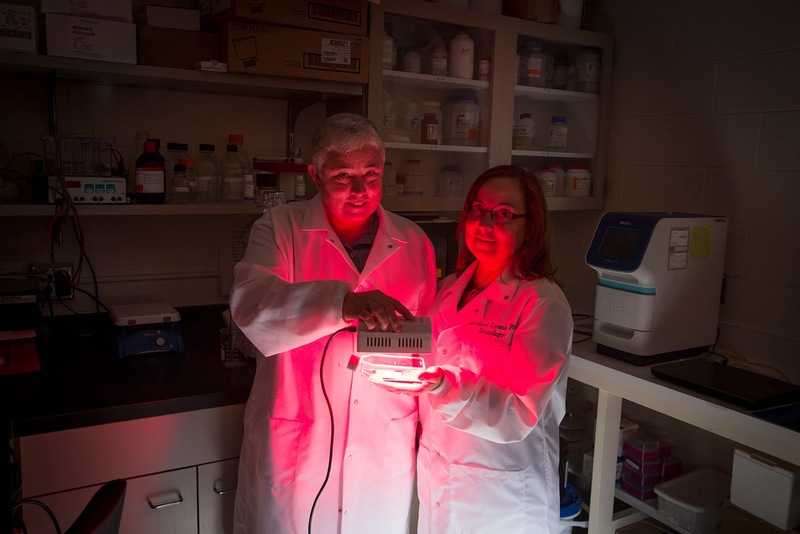 On a suggestion from a colleague, Jeri-Anne Lyons decided to test how the disease responded to a radical therapy – exposure to a certain wavelength of light called near-infrared (NIR). Scientists have known for years that certain wavelengths of light in certain doses can heal, but they are only now uncovering exactly how it works, thanks in large part to three UWM faculty researchers, including Chukuka S. Enwemeka, dean of UWM's College of Health Sciences who is internationally known for his work in phototherapy. 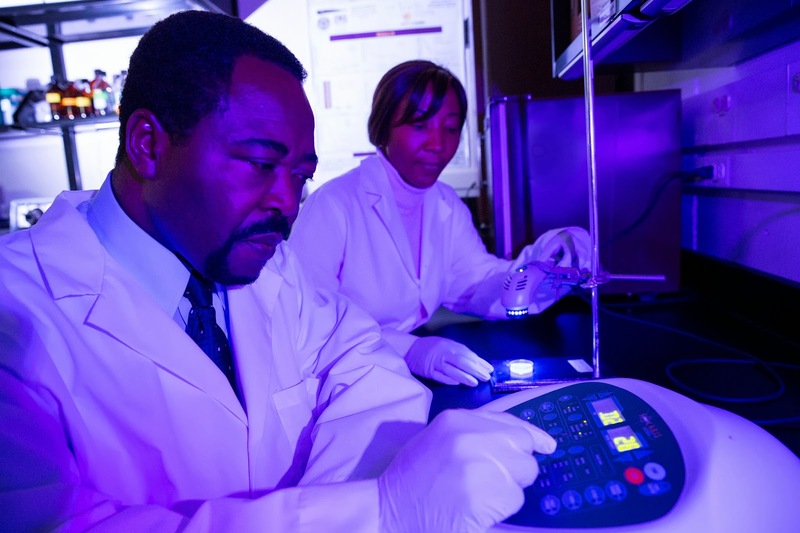 Enwemeka researches the effects of both NIR and blue light in the visible range on healing wounds. Among his discoveries is that some wavelengths of blue light can clear stubborn infections – even MRSA, the antibiotic-resistant "superbug" form of Staphylococcus aureus. Together, the UWM cluster has found that NIR and blue light repair tissue in dramatically different ways, but both act on the same enzyme in the cell's energy supply center: the mitochondria. The studies have revealed key information about managing the effects of aging and disease. In applying NIR light therapy to MS, Lyons has identified the right timing and dose. But she's also dug deeper, analyzing the effect the light had on the activities of the animal's genes. It turns out, molecules that would make the disease worse were weakened after exposure to the light, and the ones responsible for improvement were strengthened. "We're not talking about white light [all wavelengths in the visible spectrum combined] as treatment, but only certain wavelengths, at a certain intensity, for a certain amount of time," says Lyons. "Like ingested medication, it's all about the dose." "It's why we try to put antioxidants into our diets," says Lyons, "to fight that process." One source of free radicals comes from the inflammation caused by the body's immune response. The researchers have found that after an injury or illness triggers the immune response, NIR light resets the mitochondria so they function normally again. "NIR reduces inflammation," says Eells. "If you can tone down the inflammation in an eye disease like retinitis pigmentosa, you slow the progression of the disease." A similar observation with inflammation occurred in a study on recalcitrant bedsores, she adds. Wounds treated with phototherapy healed two and a half times more quickly than untreated wounds. "Chronic non-healing wounds are 'stuck' in the inflammatory phase of wound healing" The light removes that obstacle," says Eells. The question is, "What gives light in the longer wavelength its antibiotic effect?" Enwemeka's studies suggest that blue light also acts on the mitochondrial enzyme site, but allows cytochrome oxidase to bind with nitric oxide, a free radical that is elevated in the immune response. It's a pairing that poisons the invader. This theory is still unproven, but the therapy has achieved undeniable results in the lab with antibiotic-resistant MRSA. Enwemeka demonstrated that one dose of irradiation killed as much as 92 percent of two pervasive strains of MRSA. In the six years since he was asked to test the effects of blue light on MRSA, he says, research on the topic has picked up. But currently, the U.S. Food and Drug Administration (FDA) has not sanctioned the use of blue light in treating wounds, or NIR light for conditions other than wounds and pain. "It's considered alternative therapy in Western medicine. It seems too simple for people to accept," says Lyons. What the FDA is waiting for, says Enwemeka, is confirmation from a large-scale clinical study before approving phototherapy for a wider variety of ailments. It's something Enwemeka and Harry Whelan, a UWM alumnus and physician-researcher at the Medical College of Wisconsin, are determined to accomplish. "To see people who have not had relief see their wounds heal and not return," says Enwemeka of the Brazilian patients who have benefited from therapy, "is very touching." Really? I had no idea on this topic. By the way, have you heard about the new type of diabetes treatment that can improve the patient's help sitting at home? Actually, with cell regeneration system, it works.